TAMPA, Fla. (Oct. 11, 2018) – Three front-office superstars in the business of sports are slated to share the stage at the sixth annual University of South Florida Vinik Sport & Entertainment Management Program Lecture Series, presented by FOX Sports Florida and the Tampa Bay Lightning, this year. Dan Reed brings sports teams and players closer to fans through Facebook; Rick Welts is president and COO of the NBA’s Golden State Warriors, world champions for three of the past four years; and Jay Parry is the former COO of the Women’s National Basketball Association at a time when the league experienced incredible growth. 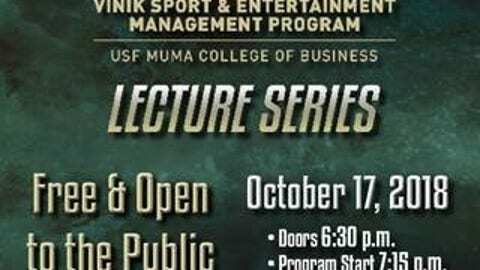 They represent the cutting edge of sports and entertainment management and will share information, experiences and strategies at the event scheduled for 7:15 p.m. on Oct. 17 in the Yuengling Center, formerly the USF Sun Dome. — Dan Reed is in charge of Facebook’s Global Sports Partnerships. He leads a team whose mission is to “connect, entertain and engage the world’s largest community of sports fans.” In this role, Reed builds strategic partnerships with leagues, teams, athletes, broadcasters and publishers, to help them grow and engage their global fan base, develop their content in innovative digital and social formats and distribute that content across Facebook’s platforms. He also collaborates with Facebook’s product and engineering teams to develop innovative and personalized experiences for sports fans, enabling them to watch video of their favorite sports, engage with their favorite athletes, express their fandom with friends and connect through live sporting events. Reed joined Facebook after a 10‐year stint at the National Basketball Association, where, as president of the NBA Development League, he led the turnaround of the NBA’s minor league into a financially valuable property and a thriving talent development system. He also served as senior director with the NBA’s Team Marketing and Business Operations unit. Reed has been named one of SportsBusiness Journal‘s “50 Most Influential People in Sports Business” for the past two years and is a 40 Under 40 award recipient from both SportsBusiness Journal and Crain’s New York Business. Reed holds an MBA from Harvard Business School and a bachelor’s degree from Northwestern University and resides in the San Francisco Bay area with his wife and two sons. — Rick Welts is the president and COO of the Golden State Warriors, winners of the NBA championship for three of the past four years. He is considered one of the most respected business executives in the league, with more than 40 years’ experience. He is in his fifth season with the Warriors, where he oversees all business-related operations, including the team’s proposed development of a privately financed sports and entertainment center in San Francisco. Under Welts’ direction, the organization has established several franchise benchmarks in recent years, as the Warriors brand continues to grow in stature. The organization has won numerous awards across all facets of the business in recent years, including in May 2014 when the organization was named “Sports Team of the Year” by the SportsBusiness Journal. Prior to joining the Warriors, he spent nine years with the Phoenix Suns, serving the organization as president and CEO for the last two seasons of his tenure. And before that, he was with the NBA league office, rising to become the league’s third-in-charge as executive vice president, chief marketing officer and president of NBA Properties. A native of Seattle, and a product of the University of Washington, Welts began his NBA career in 1969 at the age of 16, as a ball boy with the Seattle SuperSonics. — Jay Parry has three decades of professional experience in the private and sports sectors, including being the chief operating officer of the WNBA. Her career has focused on building businesses and sports franchises with an emphasis on business strategy, planning, marketing and customer experience. In June, she joined KenCreative, a marketing and branding agency based in the San Francisco Bay area, as senior advisor where she consults on national food, wine and lifestyle brands. Prior to joining KenCreative, she worked for the WNBA in New York, where she led the league’s business and strategy functions aimed at growing the game and the business worldwide. Previous to her work with the WNBA in 2016, Parry was president and CEO of the Arizona Super Bowl Host Committee. She oversaw all aspects of planning and executing a record-breaking Super Bowl XLIX in 2015. In that role, she worked closely with the NFL and numerous national and local businesses, governmental officials and other stakeholders. And before that, her career spanned an array of sports-related and corporate assignments, including senior vice president of brand and business development for the Phoenix Suns, president and COO of the WNBA’s Phoenix Mercury, executive vice president at Bank of America and the Torrey Pines Golf Course. A native of Del Mar, California, Parry has been active in community service throughout her career including the Red Cross and Juvenile Diabetes. She earned a bachelor’s degree in finance from the University of Colorado. The event is free and open to the public. To register, click here. FOX Sports Florida & FOX Sports Sun are the regional television homes of the Orlando Magic, Tampa Bay Rays, Miami Heat, Miami Marlins, Tampa Bay Lightning and the Florida Panthers. The regional sports networks have been fixtures in the homes of sports fans throughout the Sunshine State for the past 30 years. Today, the networks combine to produce more than 700 live sporting events and over 300 studio based and original programs year round. FOX Sports Florida and FOX Sports Sun are committed to making a positive impact in the communities we serve by engaging our audiences and providing award winning TV and web coverage of Florida’s hometown sports teams. For more information, channel listings and how you can get involved with FOX Sports Florida / FOX Sports Sun, visit www.foxsportsflorida.com.